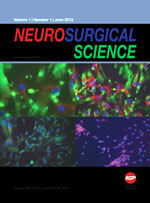 Neurosurgical Science (NS) is a multidisciplinary peer-reviewed journal that provides a platform for the timely publication of scientific articles related to clinical and laboratory research focused on neurosurgery, neurology, neuroanatomy, neuro-ophthalmology, neurochemistry, neurobiology, neurophysiology, neuropathology, neuroradiology, diagnosis, treatment and prevention of neurological disorders, psychiatry and new neurosurgical tools, techniques and procedures. The journal publishes original research articles, reviews, clinical studies, experimental studies, case reports, technical notes, book review, letters to the editor. The peer-reviewed proceedings of scientific meetings, symposia and workshops related to neuroscience are also published. Is There Hope for TBI with Stem Cell Transplantation?